Nepal Tibet Bhutan Tours is individually tailored to suit your taste, needs and timescale. This holiday can take you in to stunning Hindu and Buddhist temples, monasteries and pagodas, at their best. Travel-to-nature Asia is sure to get you closer to these fascinating cultural events, together with all the people and places that make Nepal, Tibet and Bhutan unique ever. Explore Nepal’s capital city of Kathmandu, an unforgettable melting pot of Hindu and Buddhist cultures. In the local markets and bazaars explore the wealth of Hindu and Buddhist sites as well as charming valley towns such as Bhaktapur, with its well preserved 15th century architecture. In Lhasa, Tibet’s long forbidden capital city which is 12,000 feet high, you will tour the major monuments, including the legendary gold roofed thousand rooms Potala Palace. Then walk pilgrim trails, hike up to ancient ridge-top monasteries, meet a colorful array of people, from nomads to lamas, and delight in some of the most majestic scenery on earth. Come take a step back in time and join us on this enriching journey for an eye opening look into traditions and cultures far removed from those in the West. Bhutan, the tiny Himalayan kingdom where you will visit the Shangri-La setting of the Paro Valley, the central Bhutanese town of Punakha, with its huge, spectacular monastery set by the river, and the capital city of Thimpu. Plan your multi country tours in Nepal, Tibet and Bhutan. Day 01: Arrival in Kathmandu International Airport. Your Tibet visa will be processed today. Explore the Kathmandu Valley including the Pashupatinath Temple - the holistic Hindu temple, the Boudhanath Stupa - one of the largest stupas in the world, and Bhaktapur - the 9th century city. You will also visit a traditional painting school where you will discover the underlying meaning of the dying Nepalese art. Overnight in Kathmandu. Explore ancient Patan city, one of the three main cities of the valley which is renowned as a city of arts and crafts. The main highlight of Patan are Durbar Square, ancient temples, the Tibetan refugee camp and the Patan industrial area. Enjoy the afternoon shopping for souvenirs or visit more sights with your guide. Overnight in Kathmandu. Upon arrival at Lhasa’s Gongar airport, you will be met and welcomed by your Tibetan guide and taken to your hotel. Walk around Lhasa, a city with an altitude of 3,550 meters (12,000 feet) located at the foot of Mount Gephel. Lhasa is the administrative capital of the Tibetan plateau. This ancient city is best known as the home of the Dalai Lama’s Potala Palace. In the early 7th century King Srongtsen Gompo unified the many local tribes. After unification he moved the capital from Yarlung to Lhasa and constructed Potala Palace. Visit centuries old Buddhist monasteries, palaces and busy Barkhor Street, the famous local market area. Approximately 300,000 people live in the Lhasa area. Lhasa means “Place of the Gods”. Here, the major religion is Tibetan Buddhism. Locals call it by another name, “Sunlit City.” Bring warm clothing as a cold wind runs through the city. The annual average temperature is 7 degrees Celsius. Overnight in Lhasa. Explore Potala Palace, Sera Monastery and Jokhang Temple. Legendary Potala Place is located at the top of Red Hill with the best view of Lhasa city. Potala has two parts: the first part is the White Place and the second is the Red. It was originally built for mediation in the 7th century by King Srongtsen Gompo. Years later the 5th Dalai Lama renovated it by completing the white and red wing in 1694. Now, Potala Palace is a UNESCO World Heritage site and open to visitorsa. You can visit various chapels, the gallery, the tombs of the Dalai Lamas and the official chapel of the 14th Dalai Lama until 1959. Sera Monastery is a famous historic religious site. Built in 1419 by a student of Tsongkhapa, it is one of the three largest monasteries in Lhasa, the others being Ganden and Drepung. It is a major center for the Gelukpa sect of Buddhism. Sera Monastery is 2 miles from the center of Lhasa. During the cultural revolution of 1959 the monastery was damaged and many monks were killed. It has been rebuilt and open for visitors. The heart of Lhasa is Jokhang Temple, the spiritual center. It was constructed by King Srongtsen Gompo, Queen Bhrikuti and Wencheng. This mysterious temple is located in Barkhor Square and is a UNESCO World Heritage site. The monastery s a fusion of Nepalese and Tibetan art with architecture on wood and metal. Overnight in Lhasa. Today visit Drepung Monastery, Mentshikang (Tibetan medicine center) and Norbulingka Palace. The largest monastery in Tibet, Drepung Monastery lies 6 km west of Lhasa. The construction of this Galukpa center began in 1415. In this shelter of thousands of monks you will visit the prayer hall, meeting hall, kitchen which prepared meals for 7,000 monks and more chapels. Tibetan Medicine Center (Mentsikhang Institute) was built in 1916, but the medical history goes back to the 3rd century BC. It is a Tibetan traditional health treatment center and the center for research for orthopedics. Surgery, pediatrics and internal medicine. The Dalai Lama’s summer home is Norbulinka Palace which was constructed in 1755 and includes an enormous park. There is a prayer hall and beautiful paintings and art work inside the palace. This UNESCO site is located near Potala Palace, west of Lhasa city. Overnight in Lhasa. 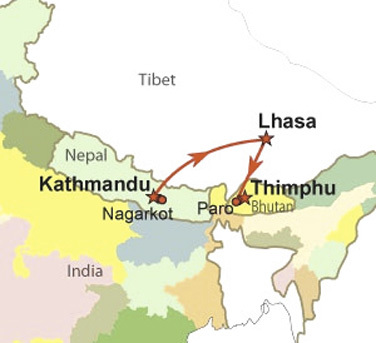 Take a panoramic flight over the Himalayas to Kathmandu, Nepal. After immigration formalities, meet your guide and transfer to your hotel. In the afternoon visit the UNESCO monuments of the Kathmandu /valley. Overnight in Kathmandu. Transfer to Kathmandu International Airport for a one hour 15 minute flight to Paro. Your Bhutanese guide will welcome you and transfer you to your hotel in Thimphu. Depending on arrival time you can do some touring or rest and have an early start the next morning. Overnight in Thimpu. Today you will explore the National Library, Heritage Museum, the 3rd King’s memorial stupa, a paper factory, art school, wood carving school and the largest statue of Buddha, the Takin’s zoo, a traditional medicine institute, to name a few of the stops on the agenda. Overnight in Thimpu. After an early morning breakfast, drive to the famous Dochula Pass (3,102 meters) where you will have the opportunity to enjoy a view of the Himalaya Range. Walk around 108 stupas and take some amazing photos. Drive to Punakha Zong and time permitting, visit the Fertility Temple via rice field terraces. Overnight in Thimpu. After breakfast return to Paro and hike to Taktshang, also known as the Tiger’s Nest. Taktsang Monastery is the holiest monument for Mahayana Buddhists. It is built on a steep hillside in the valley of Paro. Originally constructed in 1692 around the Taktsang cave where Guru Padmasambhava is believed to have meditated for 3 years, 3 months, 3 days and 3 hours in the 8th century. Guru Padmasambhava is credited with introducing Buddhism to Bhutan and Tibet. Overnight in Paro. After a breathtaking flight over the Himalayas, arrive in Kathmandu and transfer you to your hotel. Relaxing or shopping Overnight in Kathmandu.